Abacus Sports Installations is a leader in sports surfacing, from your gym, weight and locker rooms to your running tracks and tennis courts. Regupol Tracks are designed to reduce the potential for stress and injury to bones, joints, ligaments and tendons. World champion Usain Bolt trains on Regupol Tracks. Whether you're a world champion or one who aspires to be, there's nothing like running on a Regupol track. Kodiak Sports manufactures equipment, sports turf and rubber flooring for athletic training centers across the United States. This includes Artificial Turf designed for use in batting cages, soccer fields, fake grass, landscaping applications and outdoor athletic fields. Kodiak can help you with a full range of sports flooring requirements. The BSS 1000 is a full-pour polyurethane surface that allows athletes to perform at their highest level while training or in competition. This surface is durable enough to resist the roughest weather and the toughest competition and requires no advanced maintenance. Its bio-engineered force reduction layer integrates very fine SBR rubber granules with environmentally friendly polyurethane to create an impermeable shock-absorbing cushion. APT introduces Gridiron, an extremely rugged, tough-performing turf system designed to hold up to even the worst punishment any football team can dish out. The Gridiron system was specially designed to hold up to the rigors of football, with unbeatable UV, heat and humidity stability, resilient standup/re-spring, and a unique fiber shape that resists splitting and combines abrasion resistance and softness. Sometimes the game's toughest player isn't on the field—it is the field. For more than 30 years, NORDOT® Adhesives have been successfully used worldwide for installing synthetic turf, such as football fields, playgrounds, landscaping and other recreational surfaces. They can be applied at any temperature in which the installer can work, from sub-freezing to hot, desert-like conditions. They have proven long-term exterior durability in all types of climates. 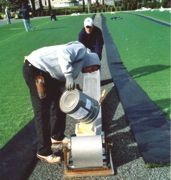 This photo shows NORDOT® Adhesive being applied to seaming tape through a glue box. When the seam is closed, a strong, weather-resistant bond will be created. This ľ-inch thick modular track mat by Turtle Plastics is available in easy-to-move 3-by-3-foot or 4-by-4-foot sections. This sturdy track mat can be picked up and stored after each event. It holds up to cleats and vehicle traffic, and features instant drainage. School colors are available. Inexpensive and indestructible. Made of 100 percent recycled plastic. A-Turf® sets the standard in the synthetic grass industry. Wanting the best for its athletes, Belen Jesuit Prep did its homework and selected A-Turf Titan for its new fields. It features: an amazingly plush, natural-looking surface; outstanding performance and durability attributes; blended Mono and XP fibers system with a great safety rating; and a 12-year warranty. Near the northern end of California's Napa Valley lies the small town of Yountville. Along with wine tasting and bocce, the community has many active tennis players. Their two courts fell into disrepair and the city planners decided the TitanTrax-Shield would be the perfect solution. This system has eliminated the persistent cracking problems and provides the players an excellent surface that will deliver high-quality play for years to come.